My friends and I discover ourselves completely surrounded by a hoard of zombies that outnumber us at least 10-1. We find ourselves shacked up in a small building, our tank and thief are desperately searching for something to help us out of the predicament, scouring the corners of this drab and dreary abandoned shop with torches in hand. Our archer is hellbent on firing at the zombies that are slowly stacking up outside, arguing with our Barbarian who wants to jump out and take them all on in glorious combat with his legendary axe. Meanwhile, our assassin is thinking of the flashiest and most extreme way to deal with the situation, utilizing all their special abilities. Then there's me, the mage, betting on rolling some sixes to fry the whole hoard. Eventually the zombies force their way into the small building and after some clutch blocks and strategy...we die. Sounds like I'm describing some sort of video game right here at the LAN right? Or maybe an intense D&D campaign? Nope. 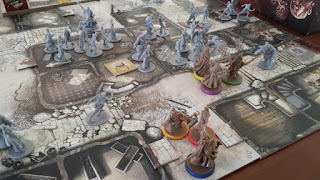 This is Zombicide: Black Plague, an excellent tabletop game from Guerrilla Games, and probably the most tense and teamwork oriented tabletop that I've ever played. Raised $4,079,204 from over 20,000 backers in 30 days. 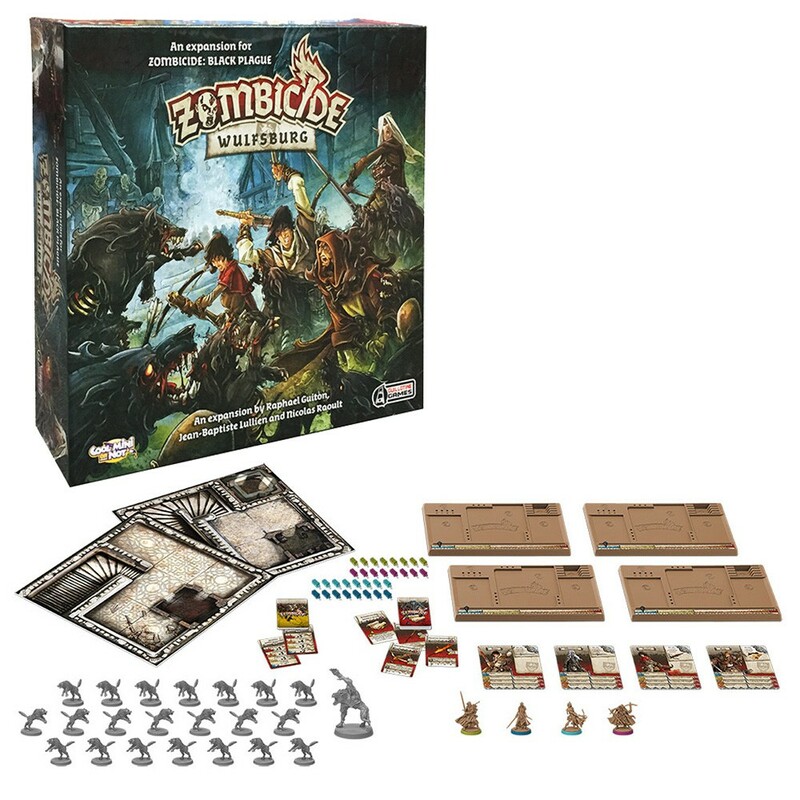 First and foremost, the name "Zombicide" is definitely not a new name in the board game scene. CMON and Guillotine Games teamed up in the past to release the original Zombicide board game and expansions, which were set in modern times. Think AMC's "The Walking Dead" or the popular video game "Left 4 Dead." This time around with Black Plague, players find themselves in a medieval fantasy world, similar to "Lord of the Rings" or "Game of Thrones". It's important to note that Zombicide: Black Plague is not a brand new game, it was actually released in 2015 via a Kickstarter campaign. 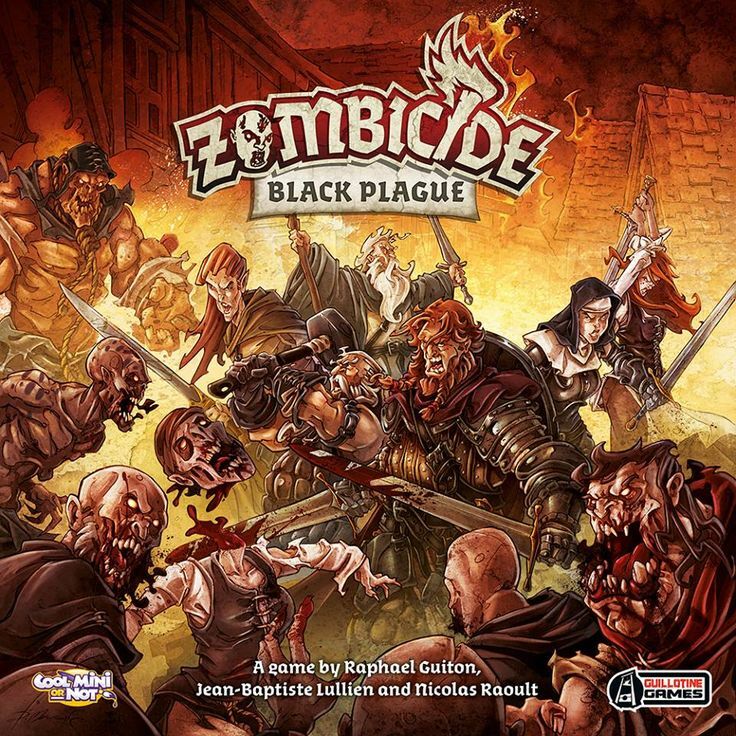 However, with the upcoming renovations here at LAN Mob, we're looking to get some board game nights rolling and Zombicide Black Plague is my best pick for a tense and strategical cooperative tabletop experience. So let's take a look! Black Plague is considered a "campaign" game, which means there are a set number of missions that are all chronicled in the rulebook included in the hefty game box. Each of these missions have a map blueprint that players follow to create the mission at hand. These maps are created by fitting the tiles referenced in the blueprint together as shown, and adding various tokens and pieces (such as doors, objectives and vaults). Each mission has a unique objective, sometimes things are as simple as reaching a certain point on the map but more often than not the objectives are a bit more challenging. Each of these missions manage to feel completely unique and separate, and thanks to the way the game is played, you can even replay these missions with no problem at all. If you're pretty creative you can also utilize the tiles to create your own missions! These tiles look great, and the pieces on the map portray information to the players perfectly. While the tile laying board system isn't a new game mechanic, it works flawlessly in Black Plague. Once the map is all set and ready to go - it's on to possibly my favorite part of Zombicide: Black Plague; building a party. Just like in any RPG, whether it be analog or digital, balancing a party to tackle the missions at hand is one of those most tactical decisions. 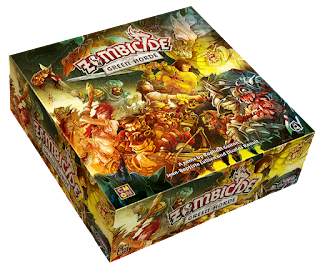 This is a good time to mention Zombicide can be played cooperatively with 2-6 players, but naturally you can play with even more. One play session of ours had 9 party members! However, most missions suggest running with 6 party members, so if you're playing with a handful of friends or even if you're running solo, it's best to take control of multiple characters to make the experience the fullest. The base game comes with six incredibly well designed characters, but that just scratches the surface. Over the last two years, Guillotine Games and CMON have released an insane amount of additional content - including a whole mess of new characters. Our playgroup has around 30 characters to choose from, and despite having a few favorites each, we spend a good amount of time picking and choosing who to play before each mission. Each character is represented by a beautifully crafted miniature and character card. These character cards represent what abilities the characters gain at certain experience levels, starting with their blue ability and going up from there. 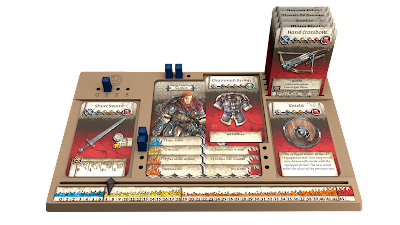 These character cards get placed in a plastic dashboard which keeps track of life, currently equipped equipment, backpack space and have a handy experience track. I cannot stress enough how beneficial these streamlined dashboards are to the overall experience of Black Plague. It's so simple to just look around the table at everyone's dashboards and character cards and understand where your party is at, and what the best moves would be. Keeping track of your party's characters isn't the only streamlined system present in Zombicide: Black Plague. Look at how neat everything is! 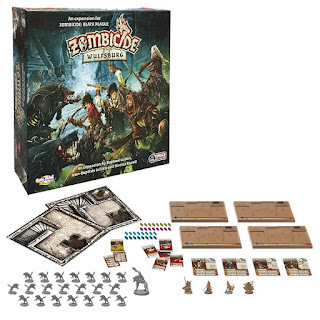 There are a plethora of these dungeon crawling RPG style tabletop games, but Zombicide definitely stands out in a few ways. Firstly, Zombicide: Black Plague is packing an incredibly unique theme. There are a ton of fantasy RPGs, and there's quite a few zombie tabletops as well, but who would have guessed that these themes working in tandem would create such an interesting setting and still manage to be so tense. Chipping away at zombies with medieval weapons like swords, axes, bows and daggers as well as magical spells like lightning bolts and fireballs, manages to be a lot more imaginative and fun then using guns, like in the original Zombicide. I suppose that's more of an opinion though. The second notable distinction is Zombicide's ability to be played without a game master. In a lot of dungeon crawling/RPG tabletops an additional human player is required to take control of the gamestate that the heroes will be facing. I cannot stress how much of a difference this can make for certain playgroups, mine included. CMON and Guillotine Games accomplish this in a really stylistic and thematic way, by giving the zombies an automatic system of moving and attacking. To put it simply, zombies will act completely on their own, utilizing a system of prioritizing line of sight and following sound. These Zombies spawn in the map in varying places based on the mission, but the game takes care of the spawning phase by utilizing a deck of cards. 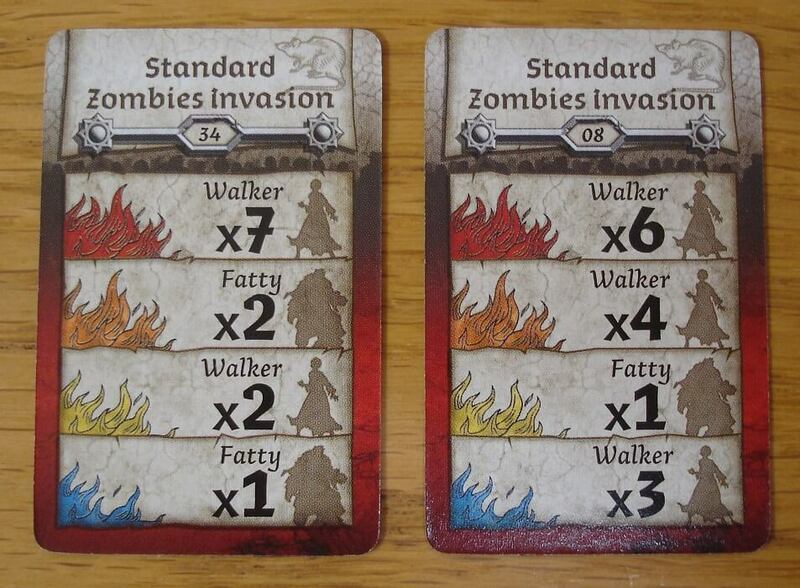 Each Zombie has it's own special traits; walkers, fatties and runners all have different traits like more health or more actions. 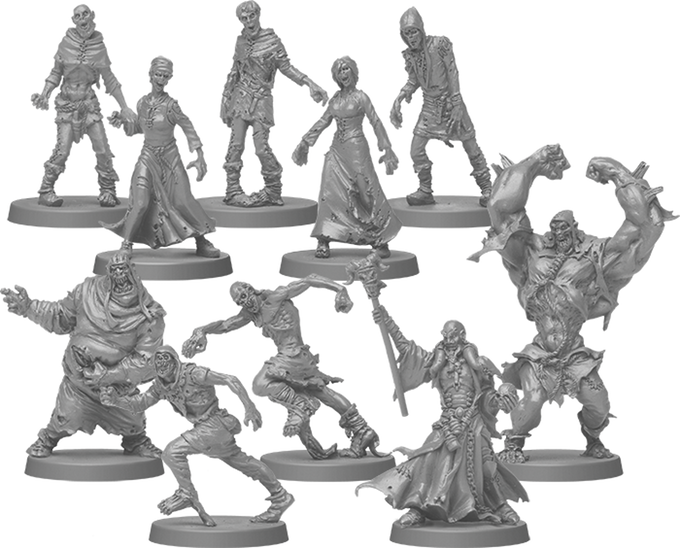 The base game of Black Plague also has two very special zombie types - The Abomination and Necromancers, which add to the chaos. The color of the flame decides the Zombie spawn. Whatever the highest level among your party may be, dictates the color. For example, if your entire party is blue except for your mage who is in yellow, all zombie spawns are the row of the yellow flame. Once again, the miniatures are incredibly well designed and so easy to paint. There's so much praise I can genuinely give Black Plague. Ask some regulars around LAN Mob and I'm sure they can regurgitate some of it, because I couldn't shut up about it! I love how tense and frustrating the game can be, but how worth it is once you finally complete a tough mission. I love how clear and concise the rules are thanks to the well written rulebook. My playgroup had some minor issues when we started to learn the game, but they were quickly taken care of over time without taking away from the early experiences. The base game comes with an incredible amount of content, which as I mentioned, was only added to over time. It's pretty hard to get bored of Zombicide thanks to the huge variety in missions available via expansions and even fan made ones online. Some members of my own playgroup have an atrocious attention span and even they tend to be pretty happy to sit down for a mission or two. You can even run the same missions multiple times and it will be a completely different experience every single time. However, if somebody forced me to focus all of my praise in one place, it would have to be the miniatures. In fact; if the miniatures weren't so incredibly detailed and awesome (I honestly don't have a better word to use) I may have never picked up Black Plague, it's basically what originally sold the game to me! 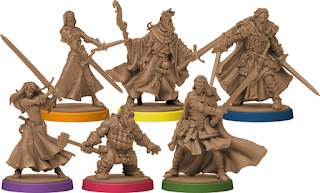 To anyone pretty familiar with the board game market, when you see "Cool Mini Or Not" or "CMON" on the box, you already know the miniatures are going to be amazing, but there's something very special about Black Plague. Don't get me wrong, the miniatures for other CMON games are incredible. Games like Blood Rage, Arcadia Quest, and a recently Kickstarted title, Rising Sun, all bring top-tier sculpts to your table. Black Plague set a standard for me, and their choices for design just hit a note. It honestly feels like a sin that I haven't gotten around to painting them yet. 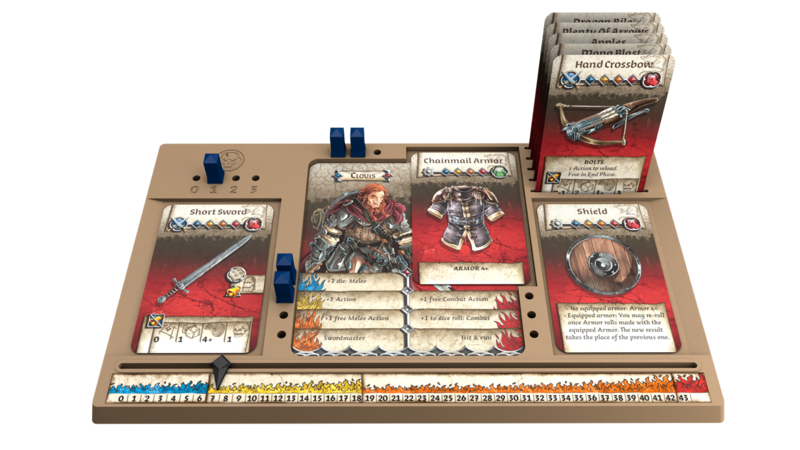 Zombicide: Wulfsburg was a major expansion to the original Black Plague. Wulfsburg added 4 new survivors, a mess of new enemy types - "Wolfz" and a special wolf boss; The Wolf-bomination. All of this on top of some new tile types, additional dashboards and some new equipment! 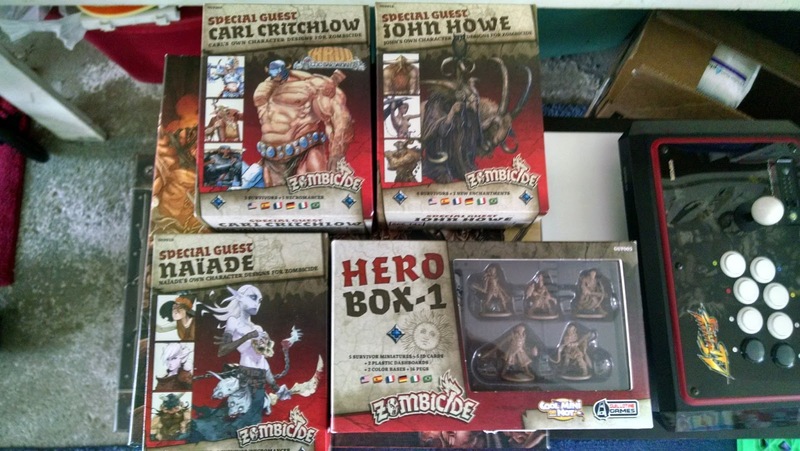 Each of these "Special Guest" Boxes include Survivors/Necromancers for Zombicide: Black Plague that have been designed by famous artists. I was ecstatic to find a Naiade box, the artist of one of my favorite board games, Tokaido. The base game of Zombicide: Black Plague sells for the suggested retail price of $99.99. To anybody not used to table tops or have never invested in a heavier game like this, let me tell you, the price tag is well worth it. This box is filled to the brim with quality content and has plenty of replay value. However, I must admit, Zombicide Black Plague might not be the game for everyone. Some missions can take upwards of two hours, only to end in a brutal loss. Some players may find that aspect game breakingly frustrating. I've even had somebody in my playgroup burn out on Zombicide pretty hard, saying the game was a bit too stressful for his liking. The other common complaint, among different groups I've played with, is the game takes too long. Once again, this isn't really an issue with Zombicide, simply players with shorter attention spans. 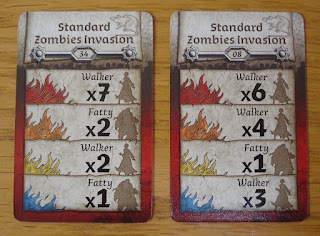 Zombicide's length is definitely nothing compared to games like Twilight Imperium 3 or 7 Ages, but make sure your playgroup understands what they are getting into. Twilight Imperium 3 games can last upwards of 5 hours, depending on how many players. Yikes. Zombicide: Black Plague has quickly become my favorite cooperative board game of all time. For a while, I was counting down the days until I could play it again. The perfect blend of fantasy RPG elements, tense combat and master-crafted miniatures make for an awesome experience every time. Like I mentioned above, just make sure your playgroup understands what they're getting into. 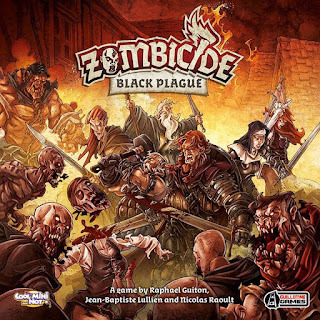 Zombicide: Black Plague will be one of our MANY board games featured at tabletop night, coming soon with LAN Mob's remodel. We look forward to tackling the zombie hoard with guys around the shop! 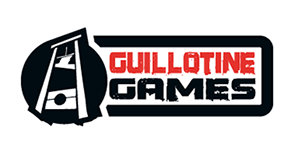 Check out CMON and Guillotine Games' websites for more details on Zombicide: Black Plague, or check out their plethora of other titles! Lastly, just yesterday, CMON and Guillotine Games released a Kickstarter for the next installment of Zombicide: Black Plague. Zombicide: Green Horde will be adding all sorts of new content and can either be played completely separate from all previous Black Plague content. However, Green Horde is also fully compatible with any previous content! I'm so stoked! Check out the Kickstarter below! Probably the most important thing is that the expansion packs (murder of crowe - unstoppable flying machines - think of hitchcocks The Birds and deadeye walker - archers) add even more diverse gameplay and should be considered an an addition by people keen for more challenge (and are the lowest cost options for expansion).